Nasi lemak is a meal that consists of rice cooked in coconut milk served with sambal and garnishes that often include hard-boiled eggs, pickled vegetables, and crispy fried anchovies. 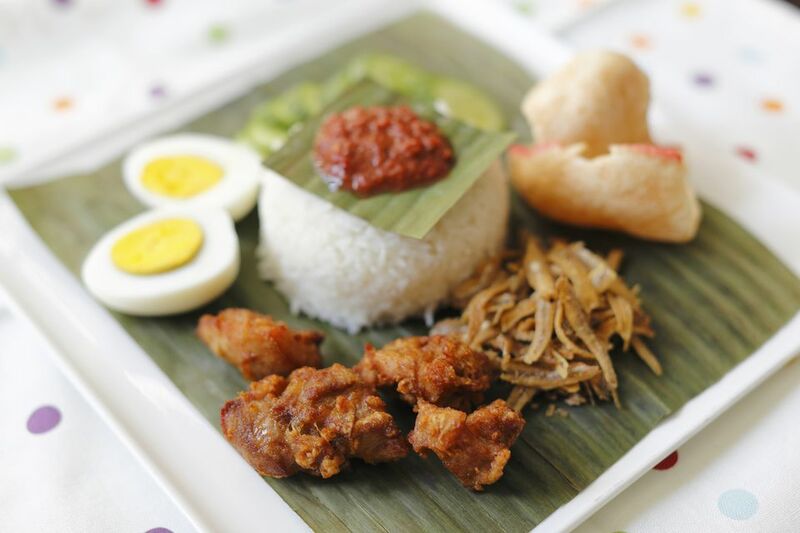 Nasi lemak is considered a national dish of Malaysia, but various versions are also found in some regions of Indonesia and the southern Philippines. The rice in nasi lemak is cooked in much the same way as rice is cooked in water except that the water is substituted with coconut milk. The richness in flavor is complemented by the fragrance imparted by pandan leaves and, sometimes, lemongrass and kaffir lime leaf. Long-grain rice is ideal for this dish as the starch content is low and the grains will not clump together. For the coconut milk, you can use freshly squeezed coconut milk, or canned or powdered. Tie the pandan leaf into a knot. Lightly pound the lemongrass stalk. Drop the pandan leaf, lemongrass, and kaffir lime leaf, if using, into the rice cooker. Pour in the rice followed by the coconut milk. When the rice is boiling, stir with a fork—one stroke is enough. Continue cooking until done. Rake through the rice with a fork to separate the grains. To serve, place a mound of coconut rice at the center of a plate. Top with a heaping tablespoonful of sambal. Arrange the garnishes around the rice. To serve nasi lemak as a snack, garnish the rice with hard-boiled egg halves and sliced cucumber. To serve nasi lemak as a light main dish, add crispy fried anchovies to the egg halves and sliced cucumber. To serve nasi lemak as a full meal, add to all the above a meat dish like beef rendang (spicy beef stew) or ayam goreng (fried chicken). To serve vegetarian nasi lemak, omit the belacan (shrimp paste) when making sambal. Garnish the rice with sliced cucumbers, pickled vegetables and roasted peanuts. Fried mock meat may also be added.